Lust List: Bags and Jewels and Peter Pan Collars, oh my! I've missed you, dear readers! Please know that it has been a crazy month, complete with travel — to Houston, Austin, L.A., Nebraska and NYC, for starters — and tons o' work and so much shopping (especially with stocking up for our next Butler & Claypool vintage sale). Plus, I met Alexa Chung at Madewell D.C., and that made me giddy enough to completely forget about blogging for awhile. Whoops. 1. 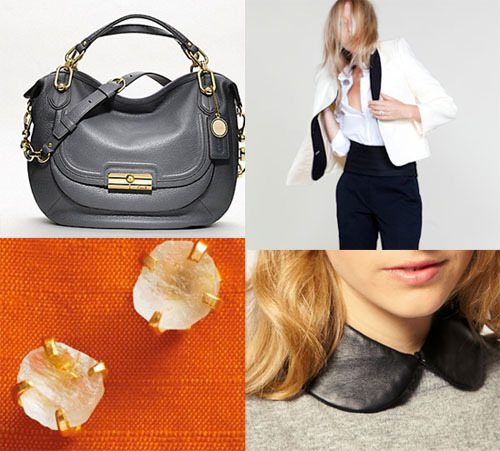 Kristin leather round satchel, Coach, $698. 2. Emerson Made white tux, $238. 3. Asos leather peter pan collar, $26.19. 4. Kate Spade aquamarine studs, $195. Love the studs, although I have never seen aquamarines in a whitish color. Quite unusual and a contrast to a pair of four prong diamond studs! Advice! And a huge giveaway! And pretty things!